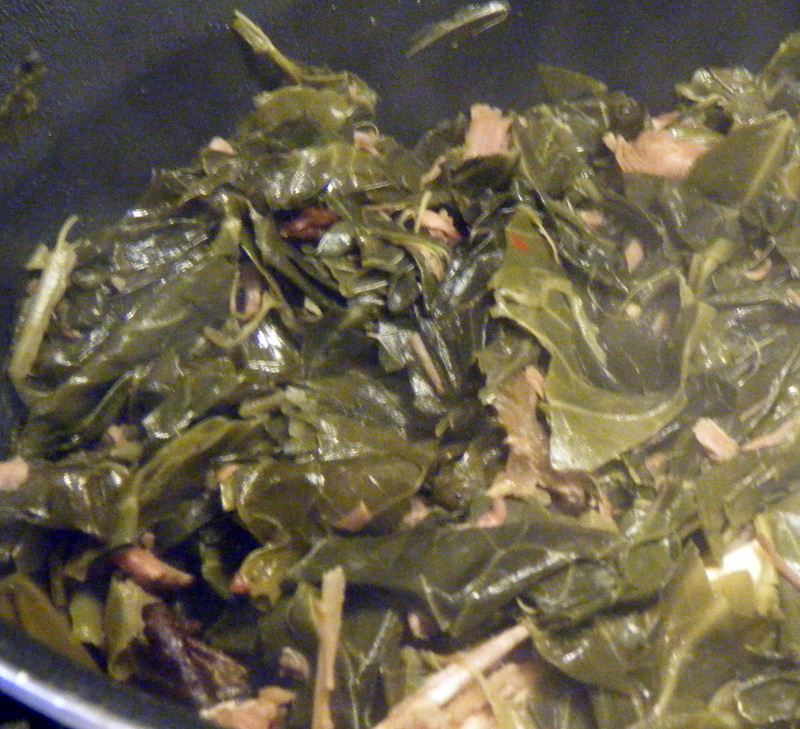 Cook: Collard Greens | CookDrinkFeast! Collard greens have a spot on many Southern holiday tables. Thanksgiving and Christmas dinners wouldn’t be the same without a “mess o’ greens.” This green leafy vegetable has a special purpose on New Year’s day. Southerners (and those with Southern roots) eat collard greens to ensure wealth in the coming year. Collard greens tend to be quite gritty, so it’s important to wash them several times. I wash mine in a sink full of cold water with a little white vinegar. I lift the greens out of the water so I can leave any grit behind. You have to remove the hard rib that runs down the middle of each leaf. I usually tear the leaves into bite-sized pieces as I wash them. You can also chiffonade the collard greens by rolling them into a cigar shape and cutting across the leaves. While I was preparing the greens for Christmas dinner, my mother asked for the recipe. This request kinda stumped me because I didn’t really have a recipe. I just put the ingredients in the pot and let them do their thing while I cook the rest of the meal. If they need something after they are cooked I just add whatever it is and serve. Mom took notes as I cooked (Thanks Mom!). All of the measurements are approximate. I season to taste. Yes this seems like a lot of greens. But as the old folks say, “They cook down to nuthin’.” Yes, I do use seasoned salt for this recipe. I find that it gives that certain je ne sais quoi to my greens that I cannot get with white salt. Cut the meat from the smoked turkey legs and put it in a large pot with water along with the bones, vinegar, hot sauce and seasonings. Simmer the meat while washing the greens. Cut or tear the greens into bite-sized pieces. Add the greens to the pot. Alternate seasonings with layers of greens. If the pot is not large enough for all of the greens at first, give it a stir. They will cook down, allowing room for more greens. Cover the pot and simmer over medium-low heat, stirring occasionally until the greens are tender. Adjust seasoning if needed. Serve with extra vinegar and hot sauce on the side.